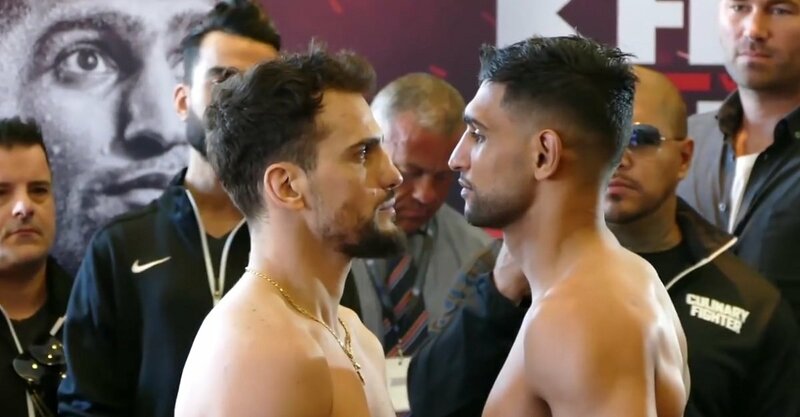 Amir Khan makes his long-awaited return to the ring this Saturday against Phil Lo Greco (28-3, 15 KOs) in a catch-weight fight at 150 pounds at the Echo Arena in Liverpool, England. Both fighters made weight on Friday with Khan (31-4, 19 KOs) coming in at 150 pounds and Lo Greco coming in a little lighter at 149 ¼ lbs. This is the biggest fight of Lo Greco’s career by far. It’s his Super Bowl. If Lo Greco wins on Saturday, it might be him that moves forward to face Kell Brook later this year instead of Khan. Matchroom Boxing promoter Eddie Hearn wants to match Khan and Brook up in a PPV fight on Sky Box Office in December. Lo Greco is one of the obstacles that stand in the way of that fight. If Khan loses to Lo Greco, Hearn will have to make other plans for Brook. This is Khan’s ring return after 2 years out. Khan had a hand injury that he had to deal with, and it a little longer than expected for him to rehab it. Khan, 31, is now 100 percent healthy and ready to show off his boxing skills against the 33-year-old Lo Greco. Khan won’t have to worry too much about Lo Greco’s punching power, as he’s not a threat to knock him out with his 48% KO percentage. Still, Lo Greco can knock out guys if they get inside his short wheelhouse. If Khan’s punch resistance isn’t the same after his knockout loss to Saul Canelo Alvarez in his last fight in 2016, then Lo Greco could capitalize on that by blasting him out in front of his own boxing fans at the Echo Arena. Khan looked electrifying in his last fight against Canelo, but he still was knocked out cold in the 6th round. It’s too bad Khan doesn’t have the chin to match his speed. He’d be nearly invincible if he had the stamina and chin to match his speed. Khan says he’s learned new stuff since he started working with new trainer Joe Goosen, who has replaced Virgil Hunter. Goosen was working on fixing Khan’s leaky defense by reminding him to keep his hands up more and focus on not leaving himself open with his habit of throwing flashy combinations. Lo Greco is convinced that Khan is past his prime at 31, and not the same fighter he was six years ago in 2012. That was when Khan was at his best, according to Lo Greco. He thinks the soft living that Khan has had from being a millionaire has caused his game to deteriorate. Khan certainly hasn’t been pushing himself very hard since his loss to Danny Garcia in 2012. Khan just had that one tough fight against Canelo, which turned out to be disaster for him in 2016. The rest of the fights Khan has had since then have been against beatable opposition. Khan still dreams of becoming a world champion at welterweight, but he seems to be on a crash course with Kell Brook before he gets to the point of challenging for a world title at 147. When Khan does choose to fight one of the belt holders at welterweight, it’s expected that he’ll fight the winner of the Lucas Matthysse vs. Manny Pacquiao for the WBA secondary 147 lb. title. In other words, we’re not going to see Khan risk his hide fighting IBF champion Errol Spence or WBA/WBC welterweight champion Keith Thurman. But none of this will matter if Khan can’t get past Lo Greco this Saturday. If Khan loses to Lo Greco, his career is over with for all intents and purposes. Hearn will still try his best to salvage the Khan-Brook fight by maybe feeding Khan a sure thing stiff that he can beat up and look good, but the interest in the Brook fight likely won’t be the same.